If you are in the business of doing house remodels you are probably aware of the EPA lead ruling and how it affects just about every aspect of your job. The EPA ruling requires all "paid" renovators who work on homes and childcare facilities built prior to 1978 to be EPA certified and follow proper safety protocol to prevent lead contamination and poisoning. Basically this requires all lead dust to be safely contained. If you fail to comply, you risk fines of up to $37,500 per day. Ouch. 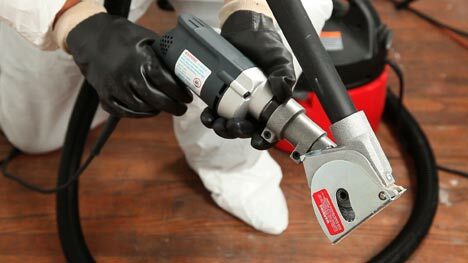 The Kett KSV-432 Vacuum Saw, when used in conjunction with a HEPA certified vacuum, can remove up to 99.97 percent of lead particles, which should help to satisfy the EPA. The plunge saw features a cast aluminum head that attaches easily to most standard shop vacuums, and allows the tool to collect the dust at the source. Kett's KSV-431 plunge saw is ideal for making cutouts in everything from drywall, plywood, plastic, fiberglass, plumbing, and even ductwork. The saw is powered by a 5.0 amp variable speed motor that spins at 2,500 RPMs and uses replaceable saw blades.